Disclosure: This post is sponsored by Honey Baked Ham. All opinions and photography are my own. This year, I get to play hostess this year for our friends and family (12 people in total) and today I am sharing some tips on keeping the kids (who have probably had too much sugar) happy while the adults can enjoy their dinner without worrying too much. Although we have a separate table for the kids, this isn’t that dreaded “kids table” you may have been subjected to as if you were some societal outcast. However, even if you do not have a separate table, these tips can help create a stress-free environment for everyone, especially the host. The first tip is definitely do not leave everything to the last-minute. Make a checklist and break it down by when it needs to be done. Week of? Day before? 2 hours before? 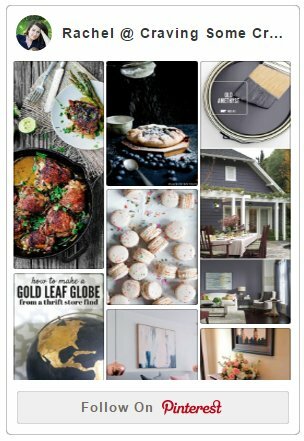 Complete some items such as decorating, setting the table, and menu planning/shopping, at least a few days before. This will give you time and flexibility for any obstacles that may arise. Although this may seem not directly related to entertaining the kids, there are some kid-specific items to consider when planning. Does anyone have allergies? Are the parents bringing any necessary items such as a booster seat or high chair, nap time items, etc? Easter brings so many activities during the day such as church festivities, egg hunts, and general mayhem with so many kids around. Of course, you want to be present, not stuck in the kitchen missing the action. Create a simple menu with your family’s classic favorites. No one wants to be the parent of the kid who won’t eat THAT! Although I love to cook, this year, I am going the stress-free route and relying on HoneyBaked Ham. The menu can be purchased a few days in advance and all you have to do is pop it in the oven and plate everything. I created a menu including a traditional beautiful ham and smoked turkey breast, broccoli rice casserole, cinnamon baked apples, and au gratin potatoes. Some quick rolls and a delectable dessert finish off the meal. The cinnamon apples are my favorite but the broccoli casserole seemed to top most people’s list. The “tablecloth” is just regular ol’ brown craft paper, but butcher paper also works well. Markers are laid out for the kids to draw on the table as they wish. They are washable, of course, just in case little Ashley wants to draw on her clothes. 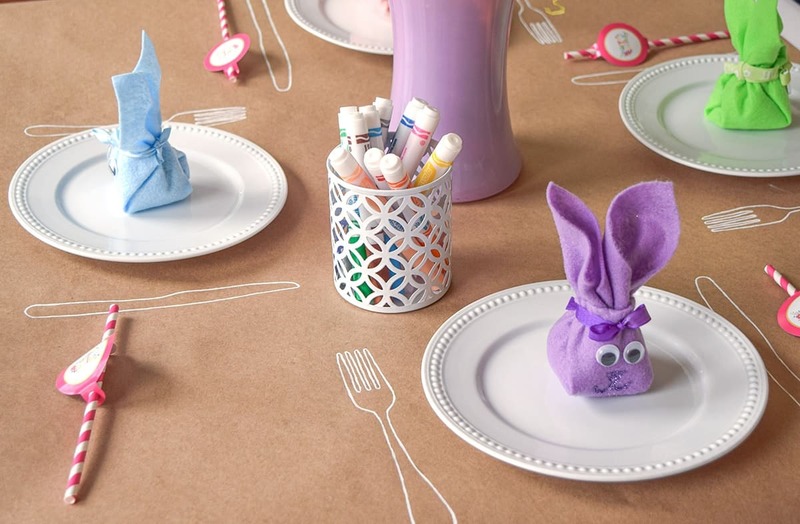 You may have a separate table or not, but you can liven up a child’s place setting that is both entertaining and functional. For our kid’s table, I added my pinwheel centerpiece that I made from last year. Unfortunately, these don’t spin but I intend to purchase some pinwheels that do at the dollar store or craft store that the kids can use. What kid doesn’t love pinwheels? I traced around standard forks and knives with a pencil and then used a white paint pen to outline them. This was just a cute touch since some of the kids will have real forks. I thought they also reinforced the idea that it was perfectly ok to draw on the table until dinner arrived. On Wednesday, I promised to show you how I intended to use my Folded Felt Bunnies that I made in under 15 minutes. These cuties are sitting front and center for the kids to enjoy. They can play with them as they are but there is also a secret inside (shhh!). Although a sweet treat would be a good idea, I used a few small toys such as spinning tops, mood rings, magnet word puzzles, stickers, or finger puppets. Avoid items that may cause a ruckus or can’t be used unsupervised like bouncy balls and whistles. If applicable, make sure you keep choking hazards out of the reach of very young children. Now I want to sit at the kid’s table! Wishing you a happy and stress-free Easter Holiday! Rachel, I love your kid’s tablescape! Brown craft paper is the best, isn’t it! I think the kids at your Easter celebration are going to have a lot of fun. Thank you for sharing this with us at the Spring Craft Blog Hop, I’ve chosen to feature this post in my Friday Favorites this week. Have a hoppy Easter weekend! I love your table ideas. They are super cute and creative. The cinnamon apples look amazing too. I think keeping it simple is key! Great ideas! I love Honey Baked Ham too! I want to sit at the kids table too! I would love it now as an adult I think, lol. Thanks for visiting and pinning! This is perfect for the kiddos table! Thank you for sharing on Show Me Saturday! Great ideas! Love the pinwheel centerpiece! The kids get all the fun stuff! This looks awesome! Thanks so much for linking up at Two Uses Tuesday! Omgosh, what great ideas! I love the kid activities! These are really good tips! Such awesome tips! Love the kids table the most. Super cute touches!